At Dish Dish, they offer a place where you can put all your favorite recipes from every place they've stacked up and into an online cookbook where you can add photos, notes, sources, comments, videos, and even create shopping lists and menus. You can easily share these recipes with friends or family through Facebook, email, Twitter, Google, Pinterest and more and save all your favorites in one place - online and convenient. With the Dish Dish Concierge Offer members get the Pro Account features and Dish Dish will add 30 recipes to your account for you! Dish Dish also offers an eco-friendly bamboo cutting board! 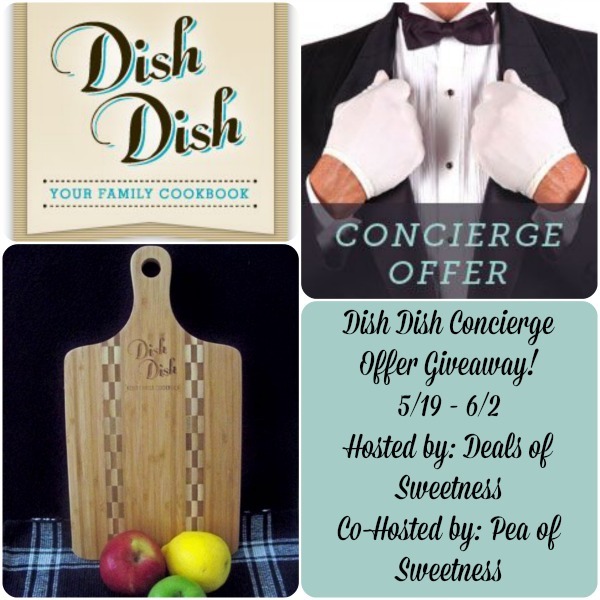 The winner of the giveaway will receive both the Dish Dish Concierge Offer and the bamboo cutting board! As an eco-conscious consumer, Emilee from Deals of Sweetness was so excited about having all her favorite recipes in one place - online and paperless! She is a big fan of paperless options and also appreciates the convenience of having all the recipes in one place to easily plug into meal planning as well as having a grocery list! It simplifies everything for the busy person who loves to cook but doesn't always have time to flip through cookbooks, recipe cards, or search through their pins on Pinterest! Of course, she also loves the eco-friendly bamboo cutting board! Check out her full Dish Dish Online Cookbook Review for more information about the Dish Dish Concierge Offer! About the prize: One winner will receive the Dish Dish Concierge offer with bamboo cutting board (ARV $49.00). About the giveaway: This giveaway begins on 5/19 and ends on 6/2 at 11:00pm (times are Central) and is open to US residents ages 18+. Please refer to the full terms and conditions in the Giveaway Tools. My favorite recipe is for pot roast. It is a recipe from my late father.